First of all, apologies for taking my pics like this in the hotel bathroom... I only have my point and shoot camera with me and left my digital SLR with tripod at home. 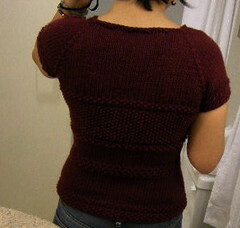 My word was this cropped, close fitted, short sleeved top quick to knit! I was done with the body in 2 days, the sleeves gave me some trouble so that took a day. All in all I finished it in 3 days. 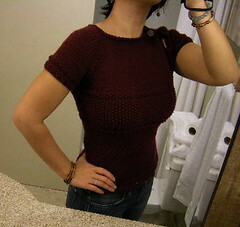 I was inspired by the Textured Tunic from the book Fitted Knits to make this top. I really like my Textured Tunic but wanted a closer fit and I did not want another long tunic. Initially, I was going to make a shawl with my Rowan Cashsoft Chunky stash but changed my mind and I am glad I did. I think I am going to wear this cute top far more than I would wear a shawl. The Textured Tunic in Fitted Knits requires that you have a gauge of 13 stitches over 4". However, my swatch with Rowan Cashsoft gave me 14-15 stitches over 4". Since I wanted my next top to have a closer fit, this was excellent! So, more stitches to the inch than required in a pattern, will cause your garment to come out smaller. More over, I decided to take out 4 stitches from the back and front what would yield an even closer fit. So, instead of casting on 80 stitches, I casted on 72 stitches and worked with that as my base. At the chest section I have chosen to use seed stitch: 2 rows seed stitch 2 rows stockinette stitch 20 rows seed stitch 2 rows stockinette stitch 2 rows seed stitch. It is so quick and easy! Working with chunky yarn gives you a quick knit! I love the heavy texture in this pattern caused by the seed stitch and chunky yarn. It makes for a sturdy knitted garment, and gives it a robust character. Yet the close fit of the top and the little tiny open shoulder slit, gives it a very feminine touch. I did not have to rip out much at all in the body. Every choice that I made was to my satisfaction and believe me, when designing stuff, that often does not happen (in my case so far). The sleeves gave me hard time. I did several stitches untill I came to the final choice of 2 rows seed stitch, 2 rows stockinette stitch and ending with 6 rows of stockinette stitch! I will not bother you with furter details but there was a lot of ripping out involved before I was finally happy with those sleeves! How did I like the yarn? I simply loved working with Rowan Cashsoft Chunky. This yarn contains cashmere and microfibre so you can imagine how soft it felt sliding through my fingers! The stitch definition that this chunky 4-ply yarn gives is simply beautiful. Making cables with this yarn would be so rewarding! How am I going to wear my Shiraz? As said earlier, Shiraz is robust yet feminine. I am thinking jeans with this top so I have chosen a button one always sees on jeans. I don't know what they are called. Besides jeans, I am also thinking wearing Shiraz with robust boots like Australian Uggs. Aw yeah... Stylin'..! Submitted by tsv68 on Mon, 11/19/2007 - 17:04. I saw this top in progress and agree that you have created another perfect top for yourself and that the yarn is just as you describe. Do you think I'm knitting something from it soon? Of course! Love the story of your departure from the Netherlands, Nancy. It so echos the many "departures" I've gone through myself. Always one must remind themselves that what follows is an "arrival." I know yours was wonderful. Hugs, Needles and Yarn Forever!!! Your top is VERY cute!!!!!! Submitted by Anonymous on Mon, 11/19/2007 - 07:17.